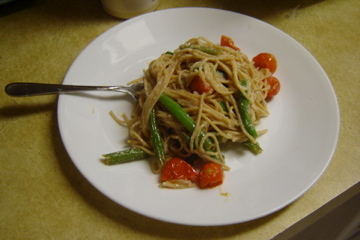 Whole wheat linguini with green beans, ricotta and lemon. interviewing her this summer for a Dallas Morning News story. I bought ingredients for Giada’s fresh tomato and goat cheese with herb oil and her whole wheat linguine with green beans, ricotta and lemon. Friday night I tried out the linguine, which actually turned out pretty good. It can be tough to motivate yourself to cook when you don’t have roommates. I often find that it’s easier to just heat up a veggie burger or throw together a salad. But cooking, I’m slowly learning, can be relaxing after a long day at work, and it doesn’t necessarily have to take a lot of time. The linguine took me about 30 minutes to make. ½ pound French green beans (haricots verts), trimmed and halved lengthwise. Bring a large pot of salted water to a boil over high heat. Add the pasta and cook until tender but still firm to the bite, stirring occasionally, 8 to 10 minutes. Drain the pasta, reserving 1 cup of the cooking water. Transfer the hot pasta to a large heat-proof bowl and add the ricotta. Toss to combine. Meanwhile, in a large, heavy skillet, warm the olive oil over medium-high heat. Add the green beans, garlic, salt and pepper and sauté for four minutes. Add the reserved pasta cooking liquid and continue cooking until the beans are tender, about four more minutes. Add the ricotta-coated pasta to the pan with the green beans and toss to combine. Add the tomatoes and toss gently. Transfer to a serving plate and sprinkle with the lemon zest. Serve. I’m in search of some other recipes. What are some of your favorites?